Registration is now open and offers four distances. Posted on February 27, 2019 by mary ann h and filed under events and tagged bicycle fundraiser. Bike MS: Keystone Country Ride is a 2 Day event that will take you farther than you’ve ever gone before. What makes this ride so special? Bike MS: Keystone Country Ride takes you from Hollidaysburg to State College. Our picturesque roads and rolling hills across central PA are well supported with fully-stocked rest stops every 10-12 miles, a great lunch stop each day and safety provided by medical personnel, HAM radio operators, law enforcement and motorcycle escorts. The ride begins Saturday morning at the Hollidaysburg Senior High School. Enjoy an evening at the Penn Stater Conference Center and attend dinner, be engaged by our featured speaker, explore the campus, and check out Downtown. After your relaxing overnight stay, you will enjoy a different scenic loop back to Hollidaysburg. Don’t miss the infamous “Cookie Rest Stop,” Snow Cones at Link Rest Stop, and the Penn State Creamery. Enjoy the fantastic celebration at the finish in Hollidaysburg with chicken, pizza and live music! Posted on July 17, 2017 by mary ann h and filed under events and tagged MS 150 bicycle fundraiser. Beginner Category - 6:00 p.m. Adult Category - 7:00 p.m. The race is called "Fire and Ice", because it's frozen, night, and everything is lit with fire...including the course. Bring a light for your bike, or try to negotiate the ride by fire alone...that's your choice. But know it's an unusual experience and one you won't soon forget! Conditions will dictate the course. This time of year, we have to take what nature gives us. It's possible that we may even ride on some frozen Susquehanna River ice. Whatever happens you'll be sure to have a great adventure andawards ceremony afterward. Come prepared to hang around! Posted on November 14, 2016 by mary ann h and filed under events and tagged cyclocross race bicycle. 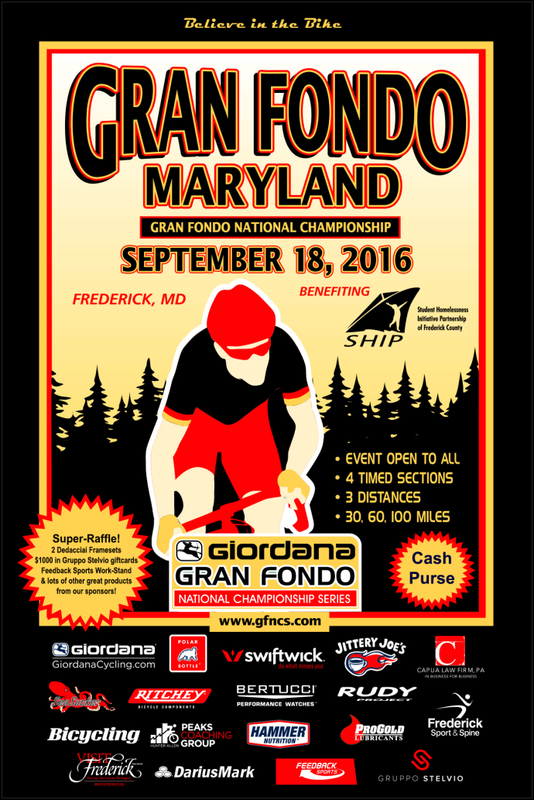 Posted on September 9, 2016 by mary ann h and filed under events and tagged bicycle Gran Fondo. This is our third annual Fairfield Fifty Bike ride benefitting Ellie's Heart Foundation. As always we have a course ride for every rider and ability. Bring your family members along. Do the family ride or walk. The start time for the 50 mile ride is at 8:30 AM. Shorter distances may start at their leisure, so long as they can be finished by 2 pm. East along bike path, slight left uphill onto Canfield Lane, East on Canfield Lane, slight right on to bike path at top of hill, take Broad Street past Montoursville Cemetery (Broad Street becomes Lycoming Mall Drive) Designated Rest Area at Fairfield Ford on Lycoming Mall Drive. Continue on Lycoming Mall Drive, continue on John Brady Driveto Muncy and North Main Street; go left on East Water Street to State Route 405 to Hughesville; take State Route 220 to Picture Rocks; take a left on State Route 864 through Huntersville to State Route 87; take a right on State Route 87 and a left onto State Route 973 to Blooming Grove Road; take a left onto Blooming Grove Road to Market Street; Turn left on to W. Third Street, Continue on W. Third Street for 1.4 miles and turn Rt on to pedestrian bridge over I-180, ride across RR tracks and turn left onto Commerce Park Drive, East on Commerce Park Dr, cross RR tracks and turn right onto Bike path, continue on bike path and straight on to Greevy Road. End at Riverfront Park. Course Distances less than 25 miles but more than 5k are available at registration. The 5K bike ride will be entirely along the bike path, the 5K walk will be around Canfield Island. Posted on August 23, 2016 by mary ann h and filed under events and tagged bicycle bike ride fund raiser. Posted on August 4, 2016 by mary ann h and filed under events and tagged bicycle bike tour. 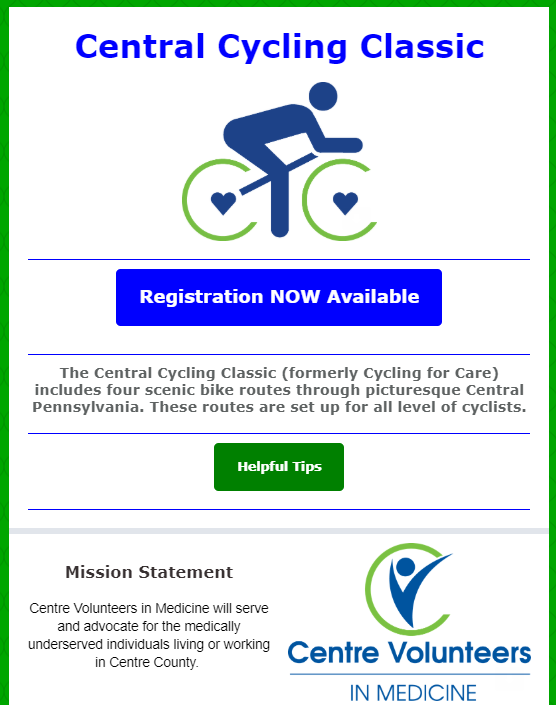 The 8th Annual Cycling for Care will be held on Saturday, June 25, 2016. The event is a non-competitive bike ride through picturesque Central Pennsylvania. This year’s rides include an 8.3 mile Fun Loop as well as the Metric Century Loop (62 miles) and Half-Metric Century Loop (31 miles). New this year was a Full Century (100 miles). The 2016 Cycling for Care event will be held June 25th. Posted on June 6, 2016 by mary ann h and filed under events and tagged bicycle CVIM. 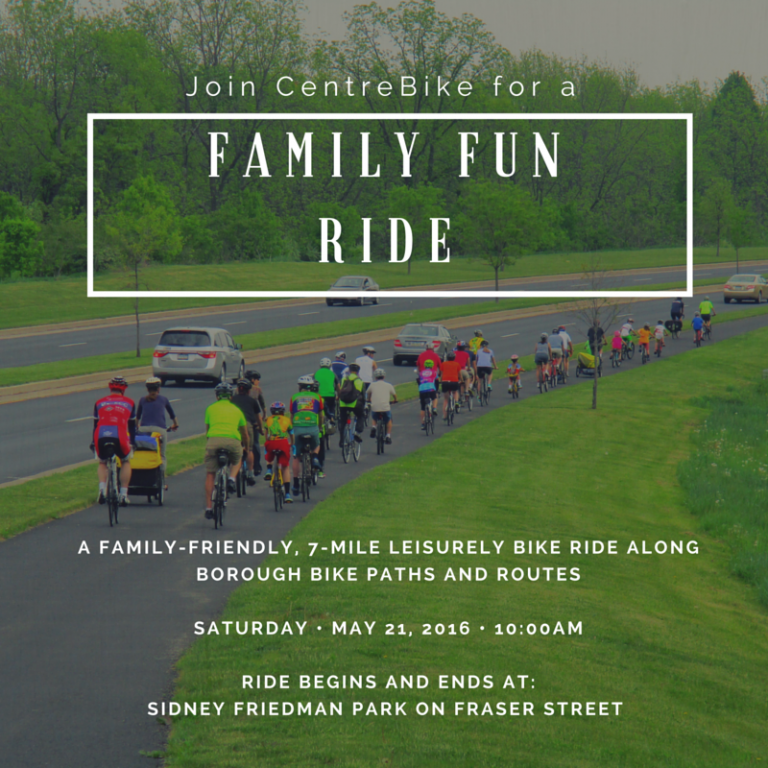 CentreBike invites you to come out and enjoy the annual Family Fun Ride in celebration of National Bike Month. This leisurely, child-friendly bicycle ride around State College typically takes a little over an hour to travel the 7-mile route through neighborhoods and on shared-use paths. All ages are welcome and bikes with child carriers encouraged. Accompanying the group will be Mayor Elizabeth Goreham, County Commissioner Mark Higgins, and a Bicycle Police Officer. * Don’t bring money… the ride, camaraderie and memories are free! * Do bring helmets, smiles, and perhaps snacks to enjoy after the ride. Where: The ride begins and ends at Sidney Friedman Park on Fraser Street. 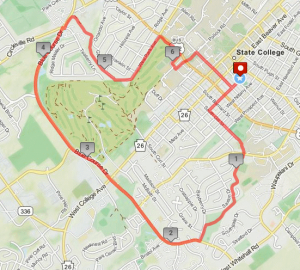 The route will take us by the High School, along Blue Course Drive, the White Course, across the IST bridge, through campus and back to Sidney Friedman Park. When: We’ll be gathering in the park at 9:45 am on Saturday, May 21st, and the ride will begin promptly at 10:00 am. Come out and enjoy the fresh air and scenery with fellow slow-rolling cyclists! Posted on May 19, 2016 by mary ann h and filed under events and tagged bicycle family familyfunride centrebike.